In an earlier post I mentioned about PDFill Tools for operations on PDF files, now i came across PDF XChange Viewer which is a very useful new utility that serves as the best alternative to Adobe PDF Reader and Foxit Reader. PDF XChange is a PDF document viewing application that also allows you to add comments and annotations to your PDF files and has the ability to open multiple PDF files simultaneously in a tabbed mode. There is also a portable version of this utility which requires no installation and can be used directly from a CD or USB stick.It can be downloaded from here. Download PDF Xchange from here. 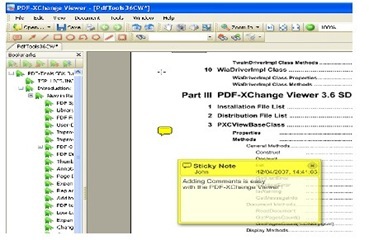 PDF XChange Viewer works on Windows 2000 and later only.